On March 17, the State Water Resources Control Board adopted an expanded emergency conservation regulation to safeguard the state’s remaining water supplies as California enters a fourth consecutive dry year. Last week the State approved more emergency water use restrictions. How does this affect our industry? How can we be more water-wise? Professor David Sedlak assures us: there is hope for the future! The Status Report - How bad is it really? It's bad - historical record breaking bad! The American Geophysical Union, studying tree rings, determined that "the current event is the most severe drought in the last 1200 years, with single year (2014) and accumulated moisture deficits worse than any previous continuous span of dry years." 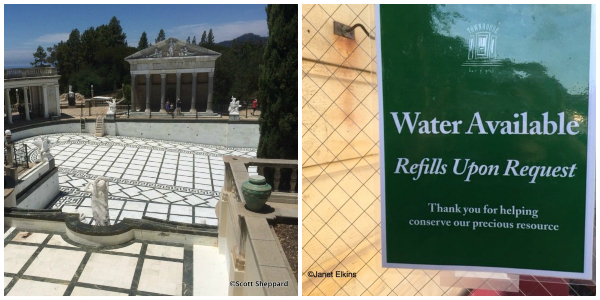 Hearst Castle in San Simeon, managed by the State Park system, complies with mandatory restrictions by leaving the Neptune Pool dry and shutting down restrooms and faucets! The 800.000 annual visitors now enjoy porta potties and hand sanitizer stations! Restaurants state-wide only serve glasses of water upon specific request by the customer. How has our industry been affected so far? 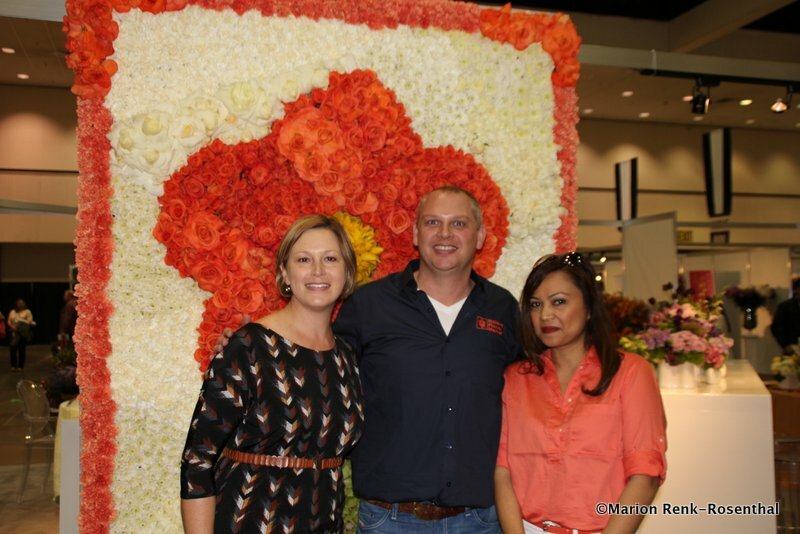 Prepare for a Supply Shortage and Price Hikes in Florals. "We are definitely feeling the impact of the drought. We buy locally grown flowers from farms in Carpinteria, Oxnard, Santa Paula, Santa Maria and Watsonville. We are experiencing shortages. Growers are cutting fields down because they cannot water the crops. Water is either not available or very expensive. So little supply meets a growing demand. In the case of snapdragons and stock flowers the prices have quadrupled. East Coast buyers are offering very high prices to get them. It's a bidding war. Peonies are in short supply. The growers told me that peonies need natural rain to grow well. Watering them artificially does not work. It did not rain this Spring so the peonies did not grow. We are also short on regular delphinium. The wedding season is underway which will put further pressure on the market and the prices." Joann Roth-Oseary, President, Someone's In The Kitchen, full service catering and event planning. Brace Yourselves for Lower Profits. 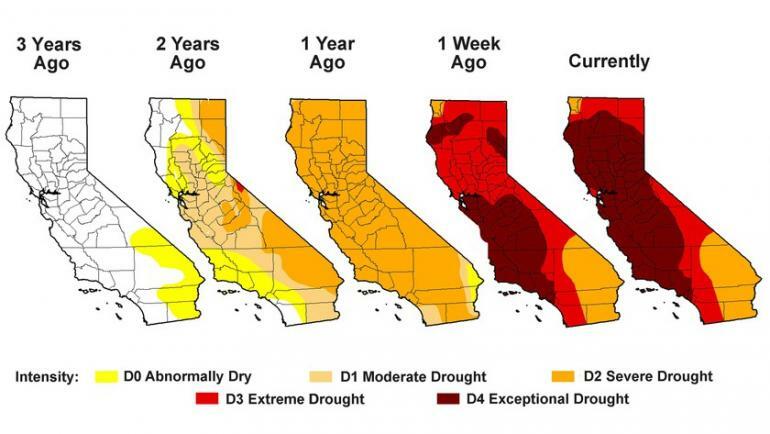 What does the drought mean to California catering businesses? "Unfortunately it means lower profits. Our jobs, particularly social ones, are booked far in advance and are price confirmed, so we cannot go back and change a contracted menu price, regardless of our costs going up. Corporate books closer in so our edge on current market pricing can be better anticipated." What can catering do to offer high-end fare at this time? "The drought does not change people's tastes in the food they want to eat. Produce is highly affected and yet is highly consumed and sought after and is not going away." "Our changes are more internal as to water usage, as we use a lot of water just in the washing etc. so we are on the employees to have greater awareness of watching what is happening in the kitchen. We have gone to water at the table side upon request, rather than just filled glass on arrival." Are you changing offerings? Switching from water-intense beef protein to a more drought friendly protein menu, for example? "No this is not happening. Clients food likes and dislikes are not water driven. We can't replace the lawn with astroturf!" Bob Amano, Executive Director, Hotel Association of Los Angeles. 1) Most hotels already have refitted their guest rooms with "water sense" toilets. In the past, flushes consumed a lot of water. In the past 10 years, the toilet flush designs have been reduced to 1.6 GPF (gallons per flush) and more recently to 1.28 GPF models. 2) At the same time, the shower heads and some faucet fixtures are being refitted to lower flow types as well. The trend of "infinity" or "rain" shower heads is changing to more modest and conservative styles and designs. 3) Eco-minded or Conserve Water tent cards or towel rack cards have been in use for several years. This allows the guest to choose not to change towels, linens and sheets daily; conserving much water used in laundry as well as being gentle on the environment as less detergent is going into the ecosystem. 4) In restaurants and dining spaces, water is only being served when directly requested by guest/patrons. 7) Public area toilet facilities are going through similar changes. Low flush toilets with sensor flushing, water sense sink faucets with sensor flow, and "waterless" urinals (in mens' rooms) with sensor flushing. These were actually in use by many public restrooms for a few years now, but are becoming a more popular fix these days. Again, each hotels has other measures independently in place, but in general the hotel industry has been conscious in eco-friendly and water-wise practices for the past 10 years.....now it's more noticeable and guests should take advantage and cooperatively participate as WE are all in this together. The Ritz Carton in San Francisco goes the Extra Mile in Water Conservation. Kevin Carroll, Executive Director of the Hotel Council of San Francisco, informed us about the Ritz Carlton's outstanding efforts. We asked their public relations representative Shelby Callas at Brandman PR for specifics. 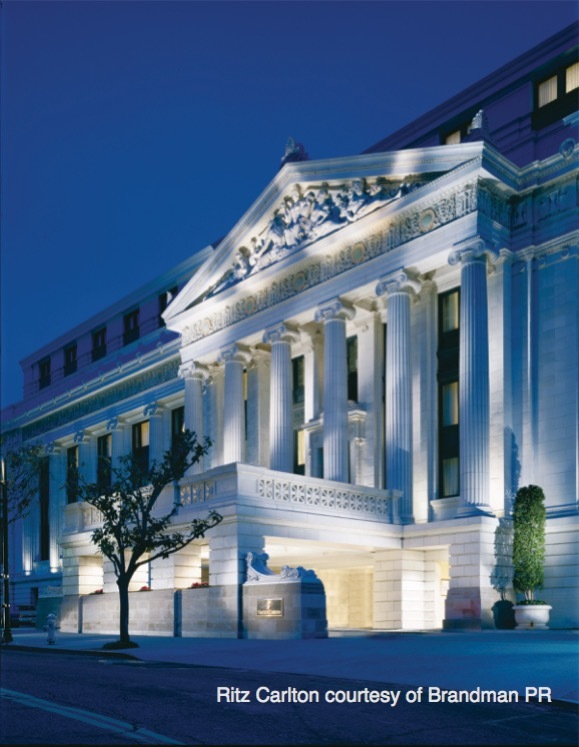 The Ritz-Carlton, San Francisco has implemented and is in the process of implementing many new techniques to actively conserve water. · The hotel plans to adopt a waterless plate clearing practice in the main dishwasher room, which uses a pressurized airline to clear plates instead of using water. · In order to recapture the condensate (grey) water which would otherwise go down the drain, the hotel has installed a holding tank with a pump system. This water is used to facilitate the wash down of the loading dock and irrigation of the courtyard plants. This is especially beneficial because by reusing the condensate water we are not using “clean” potable water to complete these two tasks. This practice results in an estimated water savings of 350,000 Gallons per annum. · We are replacing the existing guest room faucet aerators to deliver 0.8 GPM (gallons per minute). · We are replacing the toilets with dual flush options, with half flush or full flush options available. · The hotel is actively retraining behavioral best practices with housekeeping ladies and gentlemen to avoid unnecessary use of water when cleaning the rooms. The Los Angeles Convention Center, currently the focus of major expansion and renovation plans, has already implemented water saving measures and technologies. Furthermore it searches for ways to reuse water whenever possible. Just last month the LACC partnered with Green LA in such an effort. Victoriya Karpilovich, Marketing Specialist, Los Angeles Convention Center, AEG Facilities provided details. 1. What measures is the Los Angeles Convention Center taking to conserve water? • As a USGBC LEED-EB Gold certified facility, environmental sustainability has been at the fore-front of the AEG Facilities’ managed venue. • Beginning in February 2014, the Los Angeles Convention Center (LACC) has replaced 80% of sprinklers located throughout the facility’s vast outdoor areas. The improved irrigation system features leak-preventing nozzles, which have measurably reduced water usage and waste at the Center. • The LACC reduced irrigation by 33% compared to 2013 by introducing a new, water-saving irrigation plan consisting of separating vegetation areas into two zones. • As part of the refined irrigation system, the LACC Operations team is also monitoring irrigation meters on a weekly basis to ensure a timely response to any excessive water use or waste and to mitigate any issues before they arise. Project leaders have found that such precise monitoring will contribute to the LACC’s on-going effort to lead the convention center industry in environmental sustainability, a vital facet of the LACC’s commitment to excellence. • Water conservation efforts also include updating the fire pump systems; the LACC West Hall jockey pump was replaced with a mechanical seal pump, which has zero water loss emission. o The LACC teamed up with a local organization, Korean Youth and Community Center, who are part of Green LA. They plant on average 1000 trees annually. o How was it reused? 2. Do you have more projects in terms of conservation in the works to save even more? 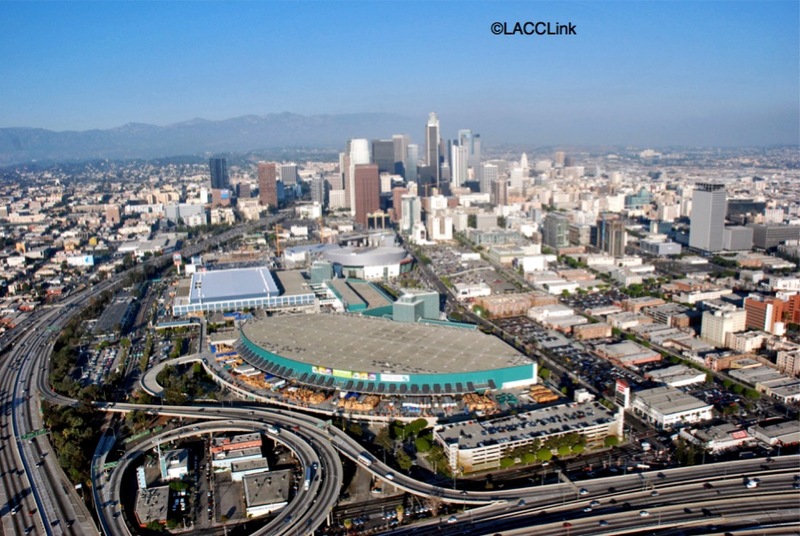 • The LACC is in the process of reducing its landscaping area by 30,000 sq. ft. and replacing it with drought-resistant plants. • The LACC has an upcoming project to retrofit existing toilets with low-flush technology. What does the future hold? What can be done? Author of “Water 4.0: The Past, Present and Future of the World’s Most Vital Resource", Malozemoff Professor in Mineral Engineering, Co-director of Berkeley Water Center, and Director of Institute for Environmental Science and Engineering (IESE) offers insight. With kind permission from Sarah Yang, UC Berkeley Media Relations, here excerpts from her Q&A with Professor Sedlak. February 18, 2014. As California grapples with what state water officials have called a drought of “epic proportions,” UC Berkeley urban-water expert David Sedlak has been watching for signs that people are ready for a water revolution. Could this drought, perhaps the worst in five centuries, provide the kick in the pants needed for a major shift in how we source and deliver water throughout the state? Consider this. Even without the drought, Sedlak, deputy director of Re-inventing the Nation’s Urban Water Infrastructure (ReNUWIt), sees signs of stress in the state’s current water delivery and treatment system. Decaying infrastructure, ranging from aging treatment plants to levees that could fail in a major earthquake, must support an ever-growing population. Instead of finding new ways to pipe in water from other areas, Sedlak projects significant growth in water recycling, rainwater harvesting and seawater desalination. “Here in California, we’ve got a confluence of factors that could spark major advances in technologies that usher in the fourth generation of urban water,” said Sedlak, a professor of civil and environmental engineering. In a conversation with UC Berkeley Media Relations, Sedlak described what this fourth generation might look like. What would this new revolution look like? Where do we need to go from here? In California, I predict we’ll see major investments in local water supplies. These new water systems will feature lots of water recycling, the capture and use of rainwater that would otherwise become urban runoff that pollutes beaches, and seawater desalination. The tough thing about upgrading water infrastructure is that it requires smart investments over a long period of time. We’re not talking about downloading software from the Internet. These are complex systems that are meant to last. Now is the time to start planning systems that will be built in the next decade. 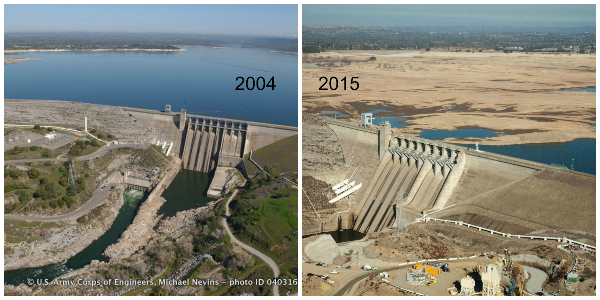 So, as we face a future of severe drought, how is Water 4.0 shaping up? Revolutions always have frontlines, and the frontlines of the water revolution are the places where the water problems are most severe. California has been on the frontlines for water recycling and is poised to take a lead on stormwater capture and use. In the case of seawater desalination, Australia, Israel and Spain are the new frontlines of the revolution. The revolution has begun, but we need public policies and investments, like those described by the president, to support its growth. I think it’s just a matter of time, especially in light of current predictions that suggest that this will not be our last severe drought. Please find the whole article online here. We agree with Bob Amano: We are all in this together! The way we live and the way we do business - with regards to water use - is changing. Our mornings now start with quick showers. We replace English lawns with drought resistant landscaping, we love the rebate programs that reward us for replacing old technology with water-saving new technologies in our households and businesses. We sweep our driveways and loading docks instead of washing them down. In the long run, every drop counts and every small little effort will make a difference in the big picture. As we hope for rain and snow this coming winter we are also reassured by the fact that Californians have a knack for adapting and most of all innovating. California is the birthplace of Google, Laser and Apple computers, after all. Our Silicon Valley companies and state-wide technology industries have sufficient financial resources to launch the New Water Revolution if the state should fail to support it. L.A. Times featured a headline last week: A State of Denial. I personally think that we have awoken to the fact that we live in a desert - and that we have to adapt to the natural facts. I don't think our state is doomed. Many countries thrive in desert climates. Copyright © 2015 EventWorks, Inc, All rights reserved.